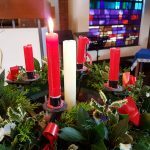 First Sunday in Advent 2018. Of the Father’s love begotten. Lo, he comes with clouds descending. Isaiah chapter 52 verses 1-10. The sermon was entitled “Something’s coming; something good”. Our united evening worship which we share with St Peters and St Botolph’s was led by Rev Tony Rose. Lord Jesus Christ, your light shines. Christ is the World’s light. Isaiah chapter 60 verses 1-3 and 19-22.